Whilst a running club might seem like a daunting prospect to begin with, surely running with a friend, colleague or family member isn’t. The extra motivation and determination you’ll get by arranging to meet and run with someone is often all you need to get you off the couch to running. Something you might otherwise struggle to do on your own. There are few running tips that are more effective than this one. Keeping a record of what you can do is an amazingly powerful tool. The realisation that you can do a bit more today than you did this time last week, gives you a fantastic feeling. So try it out for yourself. Keep a record of your distance, time, heart rate and the way you feel during the run. Scoring the difficulty of the session between 1 and 10 is also a really good idea. 1 being easy and 10 being all out effort. We all need to drink at least 2 litres of water every day, this is an undisputed fact. But if you’re being more active or specifically running more often, you’re going to lose a lot more water through sweating and breathing and all this has to be replaced. Drink small amounts regularly throughout the day and try to take a sip of water every few minutes when you’re running. Whilst running is a great sport to do, it gets you fit, you can do it anytime, anywhere and it’s free, simply relying on running isn’t the best option. If you want to be a better runner, yes you need to run, but you also need to strengthen your heart and lungs. You can do this by using any form of aerobic exercise. Cycling, swimming, walking and rowing are all examples of this. This strategy is an effective one if your sole aim is to lose weight, because your body will tend to rely on using its own fat stores for energy if there are no carbohydrates available. However, if your plan is to simply be a better runner, you’ll definitely want to have some fuel in the tank. Here’s one of the strangest running tips you’ll read for a pre training meal, but it supplies exactly the right nutrients you need before you run. Take one banana and a tablespoon of peanut butter and mix them together. Place in a microwave to warm up slightly and eat. Doesn’t sound great I know, but it’s an amazing energy food when eaten 30 – 60 minutes before a run. 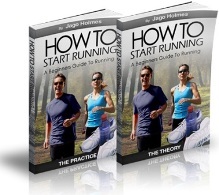 For more running tips and to learn loads more about running for beginners and a simple but extremely effective runners schedule, go here now - running for beginners and get hold of a copy of ‘How to Start Running’ for yourself.